Out of all of Jane Austen’s heroines, Elizabeth Bennet from Pride and Prejudice has resonated most with readers over the years. She’s intelligent, witty, and virtuous, she converses easily with others and never resorts to the (*ahem*) embarrassing behaviors of other women in her family, especially her mother and her youngest sister Lydia. Lizzie, however, is fond of her sharp tongue and her ability to read people. That pride triggers her character arc – and a good deal of Pride and Prejudice’s plot – as she searches for marriage based on love, not on social status or economic security. It’s no surprise that Bingley’s Teas (named after one of the families featured in Pride and Prejudice) has crafted a tea inspired by this whip-smart young lady. Miss Elizabeth, one of the vendor’s best-sellers, is a blend of black tea, fruit, and a shower of flower petals. Let’s see how this offering from Bingley’s Jane Austen Tea Series brews up, shall we? Steeping Instructions: Use 1 tsp of tea for every 8 oz of water. Heat water to boiling (205 – 208 degrees Fahrenheit / 96 – 98 degrees Celsius) and steep for 4 to 5 minutes. For starters, Miss Elizabeth is a very pretty tea when dry. 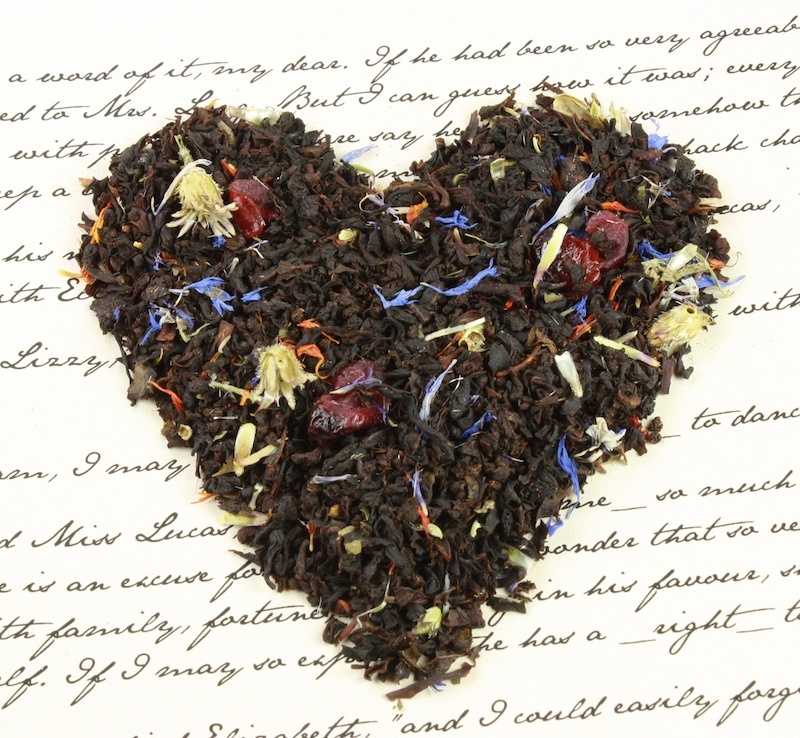 Bright blue and fire-orange flower petals pepper the black tea base. The blues are obviously from the advertised blue mallow, while the orange looks a lot like safflower. Dark red chunks of dried cranberries hide amongst the leaves as well. They’re fairy small, though; not quite the size of dried cranberries you can buy in stores. Altogether, the mixture reminds me of a tiny flower garden, bursting with color and summertime spirit. Speaking of smell, Miss Elizabeth’s surprises me a little. It’s mild in comparison to other flavored black teas, yet very sweet and with a hint of cranberry tang. It’s not like the blast of fruitiness you get when opening a bag of dried cranberries. This is more subtle. Apart from that, it’s hard to say what else the fragrance brings to mind. Maybe vanilla? I guess I’ll have to see if I detect anything more specific when I drink it. My first cup of Miss Elizabeth steeps for 4 minutes. The chestnut-colored infusion still gives off a mellow, fruity aroma. When I take my first sip, my mouth puckers from the slight tartness. Hmmmmm… I don’t taste much cranberry, but definitely something sweet. I’m not sure what kind of sweetness, though. It’s not sugary, chocolaty, or marzipan-y. I really don’t know how to describe it, other than light in body and delicately balanced. Steep #2 of Miss Elizabeth sits for 5 minutes, and isn’t much different from the first steep. Its color is still a dark brown tinged with red, and its personality still levels tartness with sweetness. Very little black tea flavor creeps through at all. Maybe there’s a trace of tannins, but there’s no bitterness or astringency. If I had to guess, I’d say Miss Elizabeth has a Ceylon black base, brighter and crisper than a more robust Assam black tea. I also tried a separate 5-minute steep of Miss Elizabeth with a splash of milk. It gives the light-bodied tea a nuanced creamy texture, but doesn’t enhance the flavor that much. I wouldn’t recommend adding sugar or honey, since this tea is already sweet enough on its own. Bingley’s Miss Elizabeth is ideal for tea drinkers looking for a black tea that’s sweet and lightly fruity but not too strong. Its mellow flavor profile could benefit from more tartness to be a true reflection of Elizabeth Bennet, but its current recipe tastes fine. I personally prefer black teas with more body and flavor (Elinor’s Heart from Bingley’s is a wonderful example). However, if you enjoy Ceylons or sweet black teas, Miss Elizabeth might be worth a try. Possible Book Pairings: Apart from Pride and Prejudice, try a cup of Miss Elizabeth with stories led by heroines who either embody Lizzie’s spirit or evolve into a braver, more assertive self. Tamora Pierce’s Song of the Lioness Quartet (starting with Alanna: The First Adventure), Rachel Hartman’s Seraphina, or Kristen Cashore’s Bitterblue are good places to start. You can purchase Miss Elizabeth Black Tea directly from Bingley’s Teas here. Squeezing in a tea review before the month is over. 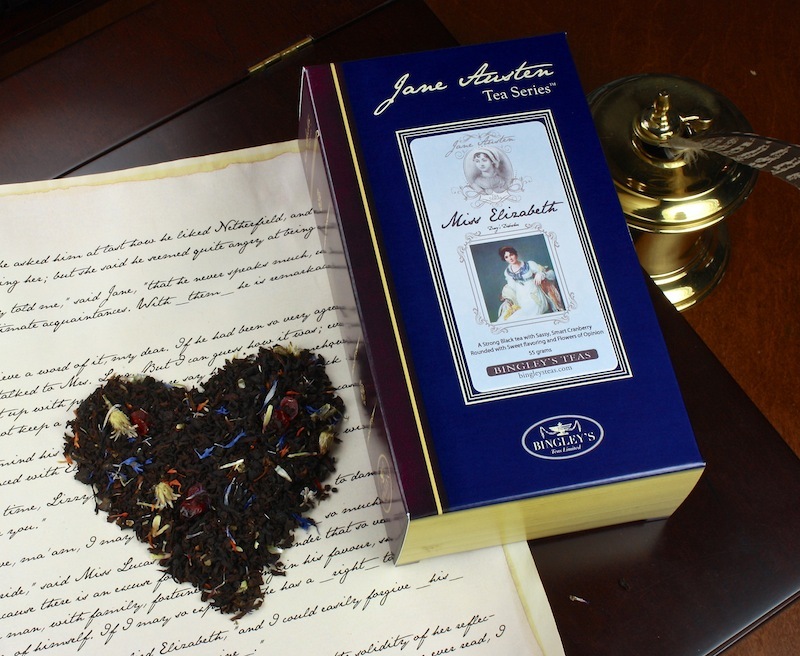 If you’re a fan of Jane Austen’s Pride and Prejudice or of black teas that lean on the fruity or sweet side, Miss Elizabeth Black Tea might appeal to your tastebuds. Read more about it now at A Bibliophile’s Reverie! Thanks, Tori. 🙂 Bingley’s sells some wonderful teas, so I highly recommend them. So far my favorites have been Marianne’s Wild Abandon, Elinor’s Heart, and (not character-inspired but SO good) Royal Jasmine Oolong.